Concord serves approximately 111 clients with over $31 billion in assets under advisement. Our client base consists of Healthcare Organizations; Religious Organizations; Foundations and Endowments; and Corporations and Insurance Companies. Concord’s average client tenure is over a decade. We believe our long client tenure is due to the quality of our advice and our exceptional service. Concord’s policy of limiting the number of clients per service team, along with integrating research and reporting, has resulted in a long list of satisfied clients. All prospective clients are encouraged to talk with our clientele to gain an understanding of why they value our services. For questions about Concord’s services please call Lynn Barclay at 609-987-9000, or e-mail Lynn. The Concord Advisory Group, Ltd. provides healthcare industry clients with investment consulting services directly related to operating, sponsored retirement plans (both defined benefit and defined contribution), funded depreciation and captive insurance company reserve portfolios. Concord’s long tenure with our religious clients is evidence of our understanding of congregational and diocesan operations. Our unique skills in understanding the SRI community, and demographic challenges are some of the factors that separate Concord from its peers. Endowments and foundations are an important focus of our firm, as individual clients and as components of our health care and religious clients' portfolios. Nonprofit organizations make up more than 80% of Concord’s client base. This vast experience has resulted in a firm that excels within the dynamics of the nonprofit board environment. 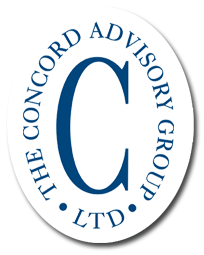 The Concord Advisory Group, Ltd. provides corporate clients with investment consulting services directly related to operating assets, sponsored retirement plans (both defined benefit and defined contribution), and insurance company reserve portfolios.